Karl Wheeler after his big win at Bethnal Green. Peterborough puncher Karl Wheeler is the proud owner of British Challenge Classic Belt after a swift victory at the famous York Hall in Bethnal Green last night (March 19). Cruiserweight Wheeler took just two round to knock out previously unbeaten Biola Kudos. The 33 year-old now wants to end his career by wining an English or British title. 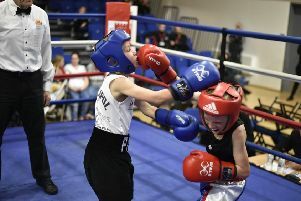 A full report on the fight will appear in Thursday’s (March 24) Peterborough Telegraph.